Do you love to keep everything of your house clean, from the kitchen sink to bathroom faucets? Your efforts might seem wasted if your bathroom fixtures, fittings, and sinks are all dulled by debris and film. When it comes to chrome products, they glimmer more than other materials. The drawback here is, chrome gets easily dirty and smudgy. Compared to other metal, chrome is easier to clean. However, this is not true if there is a strong stain or hard to remove debris and film. Do not worry. We will share some cool ideas here on how to clean your chrome bathroom fixture effectively. These techniques can also be applied to brass bathroom fixtures and other modern bathroom fixtures as well. Lemon has a strong cleaning property; hence it can be used for cleaning a variety of products and materials. For cleaning bathroom faucets and fixtures, lemon is an ideal solution. You need ¾ pieces of lemon and a piece of microfiber cleaning cloth. So, how will you do it? Let’s find out! If there is juice available, switch to another lemon. When you think scrubbing cannot remove the stain, you may apply lemon juice to chrome and leave it for 5 to 10 minutes. Now, use the microfiber cleaning cloth to wipe out left behind lemon pith and juice from the chrome fixtures and faucets. Repeat the process 2/3 times to get rid of all the dirt, debris and hard coated stains. One bonus! Do you have hard to remove smudges on one of your best bathroom mirrors? Clean it with lemon juice and water mixture, and you will have a crystal clear bathroom mirror within a minute. Mix a little amount of water with enough baking soda to make one tablespoon of thick paste. Spread the soda paste on the spotted parts of your bathroom fixture. Use the microfiber cleaning cloth to wipe out the paste. Do not forget to apply gentle pressure while cleaning the paste from the fixture. Wrap a microfiber cloth at the end of the plastic spatula and make it secure with the rubber band. Now for age-old stains and debris, scrub the pasted area with this spatula. Put gentle pressure while scrubbing. Do not use hard pressure, as you might end up scratching the fixture. After completing the scrubbing procedure, rinse it thoroughly with distilled water. Air dry or use a fresh microfiber cloth to dry the fixture. Vinegar is another substance that has a strong acidic property which can be used to remove hard stains, grime, and debris. The use of vinegar is simple. Vinegar is strongly acidic. So, be careful while using vinegar for cleaning purposes and do not use more vinegar on less water, as it will permanently damage your chrome products. Once the age-old stains, grime, and debris are gone, you want to keep your bathroom fixtures clean and shiny for rest of the time. It is not hard to keep them clean and to make sure this you need to perform little maintenance. For everyday maintenance, just wipe your fixtures and faucets with a dry microfiber cloth. A dry wipe will prevent ordinary buildup, dirt, and film from accumulating. Make a solution with few drops of dishwashing liquid in a gallon of water. 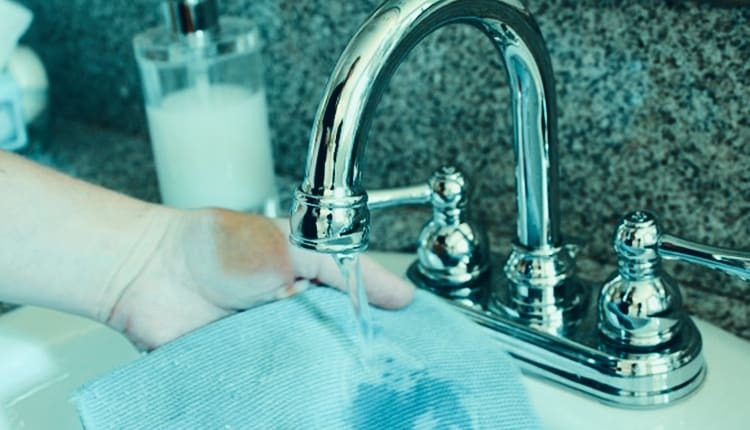 Now, dip the microfiber cleaning cloth and clean your faucets and fixture with it. Use another dry microfiber cloth to wipe out the solution or any streaks that left behind. Chrome is a softer metal compared to stainless steel or iron. That’s why; any harsh chemical can damage the chrome fixtures or faucets permanently. No worries! In our above discussion, we have not mentioned any harsh chemical to clean your chrome bathroom fixture and faucets. If you want to buy commercial cleaning solutions, make sure that they are suitable for chrome. We believe that, after reading the above article, you will be able to clean your chrome bathroom fixture more effectively than ever. While applying our given procedure, if you face any difficulty or if any other questions arise, do not hesitate to write us back.